Rhodes is the largest of the Dodecanese islands and also the 4th largest Greek Island overall after Crete (#1), Euboea (#2) and Lesbos (#3). The island is home to more than 42 beautiful beaches, an international airport, stunning landscapes, cliff side monasteries, several marinas and even a fortified old town which also happens to be a UNESCO World Heritage Site for all you history geeks out there. But Rhodes, to me, is much more than a historical Greek Island. It’s a place I feel at home when I visit. Those who have been following along with me as of late know that I’ve visited Rhodes twice in the span of a month. Not just because I wanted to explore more of the island, but because I love this place. Below, you’ll find all of my best recommendations when it comes to things to see, do and experience in Rhodes. 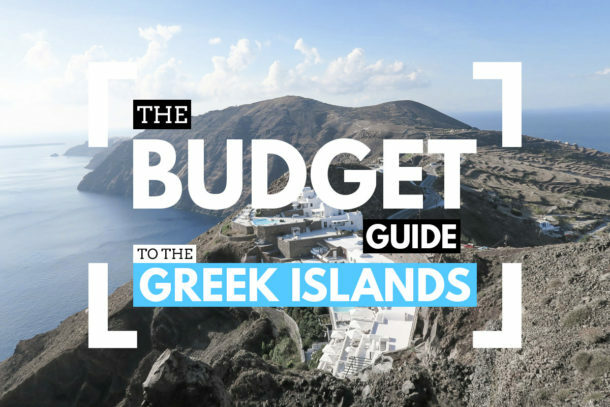 By the end of this article you’ll be able to craft your own journey to this incredible Greek island. Flights to Rhodes are plentiful and can sometimes be cheaper than renting a car in many cities across the globe. No, seriously! One of the reasons why I booked my second trip to Rhodes in July was due to the fact that I stumbled upon an insanely cheap round-trip flight from Athens to Rhodes for just 46 Euro (approx. $50 USD). Yes, that’s right. $50 for a round-trip flight. To put things into perspective, a ferry from Athens to Rhodes costs 51 Euro each way and it takes nearly 16 times longer to get there (16 hrs). Flight from Athens to Rhodes: 50 minutes. Ferry from Athens to Rhodes: 16 hours. 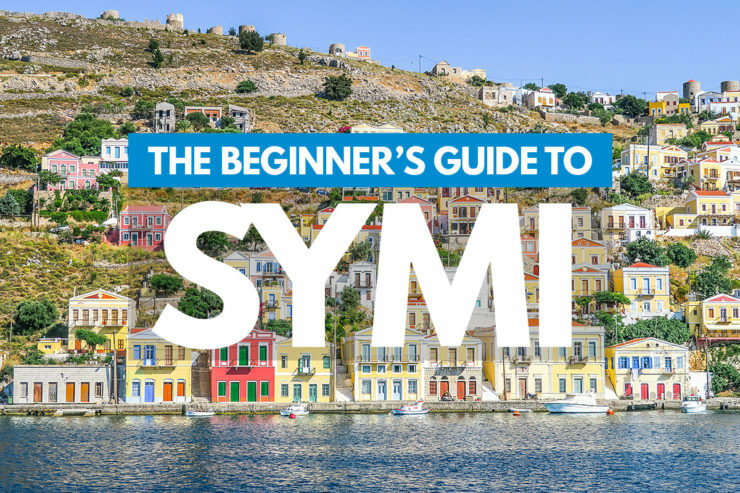 When it comes to finding cheap flights to Rhodes, your best bet is to use a combination of Skyscanner & Google Flights to compare prices, check the flexible date calendars and ultimately find out which dates and fares work best for you. You can also reach Rhodes by ferry if you prefer traveling by boat. Just remember that you will need to factor in that the ferry takes 16 times longer than a flight and is generally more expensive than flying. All I’m saying here is that I advise you to exhaust all searches for flights to Rhodes before deciding to choose the ferry as your primary mode of transportation. When searching for ferries to Rhodes, your best bet is to use Ferries in Greece, a major greek ferry booking hub that helps more than 35,000 passengers get to and from the Greek isles each year. I’ve spent time in four different Airbnb apartments in Old Town Rhodes during my two visits but instead of going into detail about all four, I’ll share my thoughts on my favorite apartment of the three. Please note that all four apartments that I stayed in were owned/managed by the same Airbnb host and two of the apartments were identical to each other just on different floors. 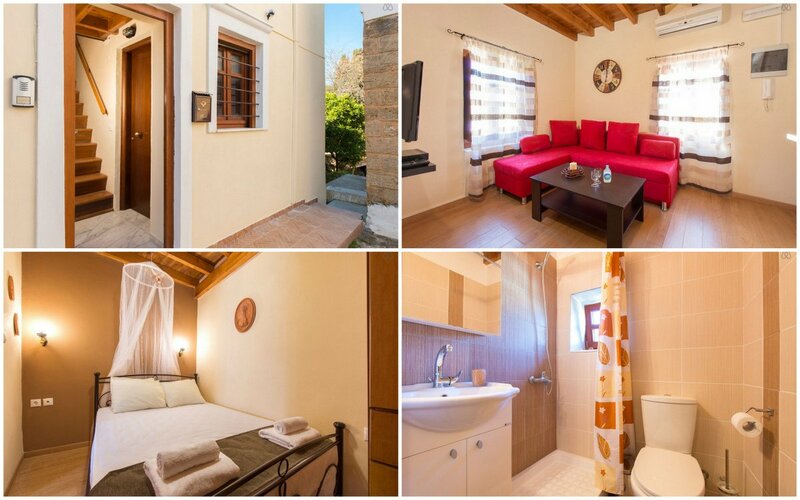 The 3 Charities Euphrosyne apartment is a simple 1-bedroom/1 bath apartment located on the eastern edge of Old Town Rhodes. The apartment is a great option for couples and possibly one extra person if you count that the couch in the living room area folds down into a bed. It had all the amenities I could ask for including A/C, two burner stovetop, cable TV, Wi-Fi and mini refrigerator. When it comes to location, the 3 Charities Euphrosyne apartment can’t be beat. It’s tucked inside the castle walls of Old Town just steps from Lagani’s and Nimmos Traditional Restaurant, a 5 minute walk to the tourist ferry pier and a 15 minute walk from the Mandraki Marina. Overall I highly recommend this apartment to those of you who are planning on traveling to Rhodes in the near future. If you try to book the 3 Charities apartment and it’s reserved, be sure to see if my second favorite apartment in Rhodes has availability. Airport taxis are plentiful and easy to find considering the Rhodes airport is quite small. All you need to do is exit baggage and customs and head straight for the doors. Once outside you’ll see a big line of navy blue taxis ahead of you. Head to the front of the line and tell the driver your destination. If you’re headed to Old Town (like I was), you should know that a taxi from the Airport to Old Town Rhodes cost a flat fee of 22 Euros so there’s no need to haggle your way into town once you land in Rhodes. The 20-25km (12-15 mile) ride takes about 30 minutes and the first half of the journey brings you along the coastline where you’ll get a sneak peek at some of the beautiful beaches that run along the coast of Rhodes. Note: Taxis from the airport to other parts of Rhodes are all flat fees. There should be a sign outside next to where the taxis line up. General taxi rides (not to/from the airport) can be quite expensive depending on your destination. It’s usually a lot more affordable to rent a car or motorbike for the day/week instead of having to rely on expensive taxi fares. Beware: There are known scams that involve switching out bills quickly once a passenger pays. For example: You give a 50 Euro note and the driver quickly swaps it with a 10 Euro note and tries to take advantage of the fact that you’re not used to using handling Euros and you could have easily mistaken the 50 Euro note for the 10 euro note as they look somewhat similar. My best advice for this type of situation is to say the bill out loud when you’re paying the driver. Example: Here’s 50 Euros. This way the driver knows that you acknowledge how much you’re paying and you know what you’re handing him/her. Don’t afraid to be verbal and if you do find yourself in a situation where you’ve been scammed, contact the nearest police officer. 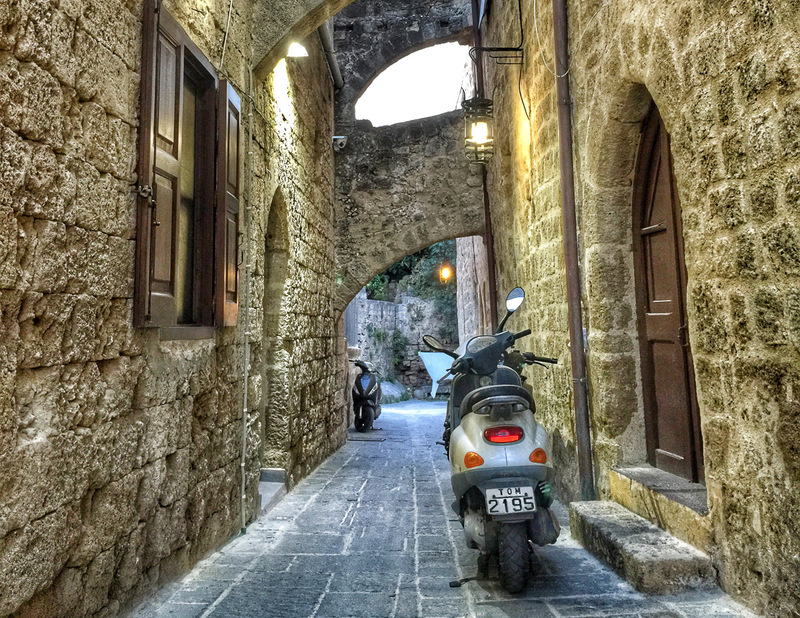 The best way to explore Rhodes is by car or by motorbike. Cars can be rented for around 40 Euros/day while scooters can be rented for as low as 15-18 Euros/day. More powerful scooters can cost around 30 Euros/day and are well worth it if you’re traveling with a passenger as they’re a lot more comfortable. Recommended Motorbike Rentals: Thomas Rentals located across the road from Nimmos Traditional Restaurant in Old Town Rhodes. Recommended Rental Car Agency: Any of the agencies in the plaza directly across from the Rhodes Tourist Ferry Port. See the map at the bottom of this post for more information. Tip: Before returning your car or motorbike, don’t forget to fill the gas tank to the same level as when you received it. Otherwise you’ll end up being overcharged for fuel due to your mistake. Many people rent bicycles to explore Old Town and even destinations outside of Old Town such as Faliraki. I personally wouldn’t recommend renting bicycles in Rhodes. Not only is it burning hot during the summer but the roads are main roads from Old Town to Faliraki they really aren’t built to accommodate cyclists. Not to mention that there are some hills involved that you’ll need to push your bike up and take one look at the aggressive driving of the Greeks and you might quickly change your mind about renting bicycles in Rhodes. If you’re wanting to cruise around Old Town and visit some beaches in Rhodes town then I recommend renting bicycles. Otherwise, don’t bother. It’s not worth the hassle or your life. As I mentioned earlier, the Medieval Old Town of Rhodes is a UNESCO World Heritage Site. Unfortunately, as those of you who have been following along with me over the years know, I’m not really into history so I can’t pretend to know much about the island, historically speaking. Sorry! 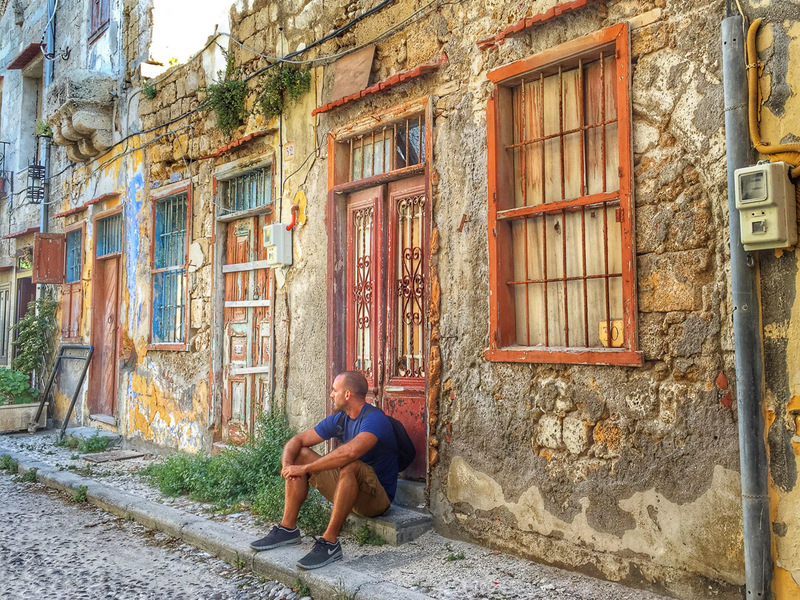 What I can tell you are some of my favorite spots in Old Town Rhodes. Hermes – One of the most affordable restaurants in Old Town run by a very friendly man named Hermes. Not too many tables here so be sure to arrive early if you’re planning on having dinner here. Food is delicious, portions are huge and the prices are as cheap as it gets. The chicken souvlaki plate is to die for. Oh, and you can get giant beers for just 2 Euro. Great place to start your evening before heading out to the bars. Odyssey Restaurant – This place offers up delicious traditional Greek dishes. This restaurant is a must if you’re looking for traditional Greek food and the prices are very reasonable considering they’re located in a touristy part of town. Try the Giouvetsi and sip your free shot of Ouzo at the end of your meal. Located in the center of Old Town. Nimmos Traditional Restaurant – Great traditional Greek food and seafood. Good prices, decent portions and friendly service. Easy walk if you’re in Old Town. Saffron – This restaurant is not located in Old Town but I had to mention it anyway because it was one of my best meals in Rhodes. Saffron is an Indian restaurant located in Rhodes town (not Old Town but close enough to walk) and they offer up some of the most delicious Indian food I’ve had to date. Saffron is one of the highest rated restaurants in Rhodes according to TripAdvisor and rightfully so. I had the Butter Chicken w/ Saffron rice with naan bread and it blew my damn mind. If you’re staying in Old Town you could make the 20-25 minute walk or take a taxi for approximately 5 Euro. Explore the Medieval City – Old Town Rhodes is known to be one of the best preserved and most extensive medieval towns in all of Europe. Take advantage of this by exploring all of its little nooks and crannies. Walk around the outside of the castle walls, wander the maze of alleyways, visit the monuments and museums and stroll down the avenue of the Knights. Romantic After Dinner Spot – Take your significant other out to the jetty along the castle wall that faces the tourist harbor and grab yourself a seat on the bench facing the sea. Note: This spot is pretty hidden but you can find the location easily if you follow the point on my custom map at the end of this post. Pili Agiou Pavlou – Visit this spot to snap some really unique photos while looking through the old castle walls that face out towards the sea. See the map at the end of this post for the exact location. Treat yourself to a gelato – Grab a 1 Euro cone at the gelato stand on the edge of Mandraki Harbor. Fresh Catch – Watch the fishermen catch fish at sunset and take photos of the boats entering Mandraki harbor. Lindos is both a town and archaeological site located approximately 58 km (36 mi) south of Old Town Rhodes. Getting to Lindos – Lindos is easily accessible by car and motorbike although if it’s blazing hot out and you have the extra money to burn, go for the rental car option over the bike. Trust me, I’ve done the ride to Lindos on both a motorbike and a car and the car was much more comfortable and a hell of a lot less exhausting. That being said, I would definitely take a motorbike there again if it wasn’t the peak of summer. A taxi from Rhodes to Lindos is pretty much out of the question as it would cost a fortune. 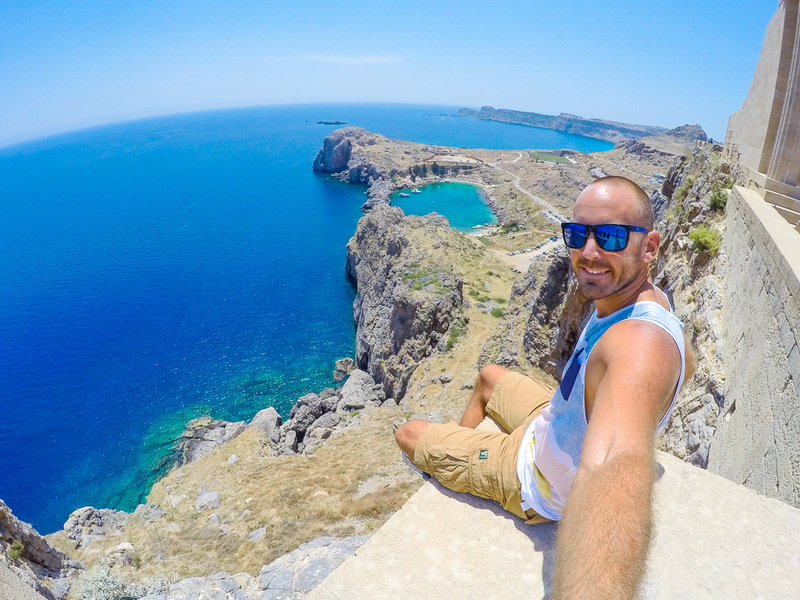 The Acropolis – The Acropolis that sits high above the town of Lindos is absolutely amazing and is a must see if you’re looking for some of the best views in all of Rhodes. One thing I should mention is that the climb up to the acropolis requires you to be somewhat active and able to climb stairs, lots of them. The trail begins through town and slowly but surely starts to get steeper as you climb the hill towards the acropolis. Once there, you’re rewarded with historical buildings dating back to 300 BC. More information on the Lindos Acropolis can be found here. St. Pauls Bay – The beautiful bay seen in the photo above is known as St. Paul’s Bay and it’s even more incredible in person than it is in this photo. Don’t forget your camera! If you’re interested in spending some time soaking up the rays at the best beaches in Rhodes, you’re going to have quite a tough time choosing between all the beautiful beaches as just about every beach in Rhodes has different characteristics and each one seems to be more amazing than the next. Anthony Quinn’s Bay – (Photo shown above) Anthony Quinn’s bay is one of the most beautiful bays I’ve ever witnessed with my own eyes. The bay is located 17km (10 mi) south of Old Town Rhodes and offers some incredible photo opportunities to say the least. The beach at Anthony Quinn’s bay is one of the best beaches in Rhodes (IMO). Get there early if you want to snag a sun chair and umbrella and enjoy wading around the bright blue and green water. Amazing! For the best views of Anthony Quinn’s Bay from above, head on up to the windy road that leads up the hill just north of the bay and you’ll find a spot where you can sit and enjoy the virtually 180 degree views of Rhodes and its coastline. This is hands down one of my favorite spots in all of Rhodes. After a long day of driving my motorbike in the blazing hot sun, I stood at the edge of the cliff with Anthony Quinn’s bay beneath me and I cracked open a can of Cayman Jack. It was so relaxing and refreshing to kick back and sip on a margarita with views like this surrounding you. Tsambika Beach (or Tsampika) – (Photo shown above) Tsampika beach is located 30km (18 mi) south of Old Town Rhodes and is a great place to spend the day in the sun. Note: There is a small section where nudists congregate on Tsampika beach. For the best views of Tsampika Beach, head on up to the Panagia Tsampika Psili Dimou Archagkelou, another one of my favorite spots to take photos in Rhodes. Rhodes Beach – This is your standard beach located on the north western tip of Rhodes, just a few steps from the infamous “Bar Street”. I honestly don’t even know the name of this beach so I’m naming it Rhodes beach. Lakido Beach – Just opposite Anthony Quinn’s Bay is Lakido beach. It’s literally 3 minutes walking distance from Anthony Quinn’s bay so visiting both beaches in a day is totally doable. As a matter of fact, I would highly recommend visiting both if you get the chance. Faliraki Beach – I did not personally visit this beach but thought I should mention it considering it’s one of the most popular tourist spots on the island of Rhodes. I’m not sure why people stay here but I assume it’s due to the fact that most tourists that stay in Faliraki are there on a sun holiday (aka package holiday) which includes your flights, hotels, and sometimes even food at deeply discounted rates. In my opinion, Faliraki is way too far away from Old Town. Again, I’m only mentioning it because it’s a popular beach destination but do your homework before deciding to stay here. Oh and I should also mention that I stopped by the beach briefly and I have to say there are a lot better beaches on Rhodes. Well, I hope you guys found this post helpful. 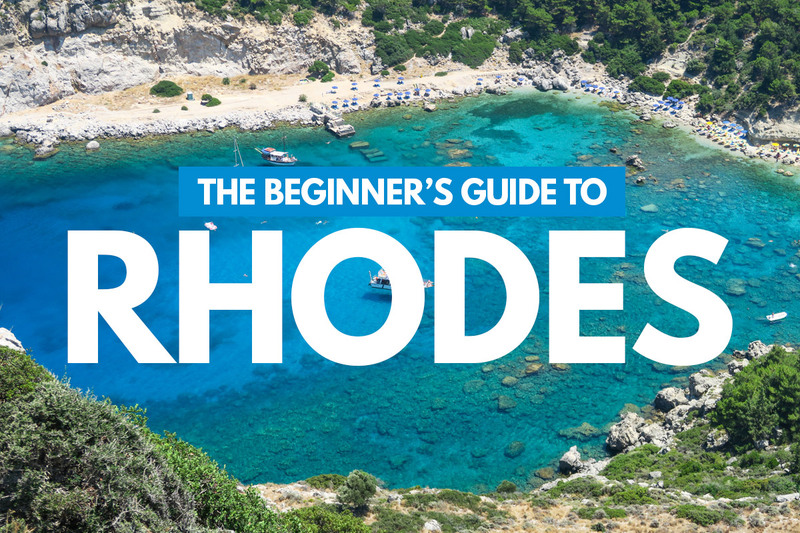 I think this beginner’s guide to Rhodes will prove to be a really good resource for those of you who are planning on crafting your own journey to this beautiful island. So tell me. Have I inspired you to visit Rhodes yet? Let me know in a comment below. This experience was made possible thanks to my partnership with Cayman Jack. As always, all content and opinions are entirely my own. This is some great information about Rhodes! My friend is actually going there next month, so I will pass this post on to him. He’ll especially appreciate your advice about taking a car or motorbike to Lindos. Thanks! Awesome. Glad to hear it. Thanks for the comment. He never mentioned pefkos. Brilliant!! Always wanted to go to Rhodes. Thanks for the tips. How safe are the motorbikes for riding? for someone who never used before?! Do you need a license for it before renting? Hey Anahita. The quality of the motorbikes can vary from rental place to rental place. Be sure to check them out before you rent. Some agencies require a license, others do not. I do recommend you have a motorcycle license and/or experience riding before taking one out for the day. Many people get injured on motorbikes/scooters due to lack of experience and not just in Greece. Thanks for stopping by! Glad I could help with your trip to Rhodes! So excited I am heading here for Memorial Day/May Bank holiday!! Thanks Maxine! Late summer/early fall is usually the best time to visit most of the islands in Greece as tourism starts to die down. September is a great month to visit Rhodes or any other Greek island for that matter. Best of luck in Rhodes! I am actually going to Rhodes in September this year, we are staying in Fanes, a small area away from the main tourist areas, but thankfully have arranged car hire with a local place rather than the airport. I am a keen adventurer, like to explore as much as poss, but also a very keen swimmer and snorkelling, I hear Antony Quinn Bay is good for snorkelling, can you recommend any others? Hi Laura. Glad to hear you sorted out the rental car. It’s pretty necessary to have one considering that you’re staying in Fanes. Either way, I recommend having one because the island is very big and there’s lots to explore. As for snorkeling in Rhodes, I recommend you check out Anthony Quinn Bay (as you mentioned) as well as Ladiko Bay and Kathara Bay. Enjoy your trip and let me know if you have any further questions about Rhodes. hi there! where exactly did you take this photo? Hi there. This photo was taken from the Acropolis of Lindos on the island of Rhodes. The views from the Acropolis look directly down on St. Paul’s Bay below. I highly recommend you visit if you’re in the area. Let me know if you have any other questions and I’ll be happy to help you. Thank you for the info and great tips. A group of us will be in Rhodes for a nursing conference in May 2017. We are only there for 5 days. Can you suggest places we should try not to miss? Scared to drive in a foreign country so we will not likely rent a car. Besides none of us can drive a stick shift which I was told the rental cars are. Are there buses that can take us from point A to point B? Hi Cora. Excellent! Please don’t be afraid to drive in Greece. Especially in Rhodes as it’s pretty much necessary in order to explore the island. Unfortunately, there’s really no other way around it. You can find automatic rental cars without any issue at all so again, no worries. Driving is very safe and easy. If you were afraid to drive in Athens, I would understand but being on an island you should have no issues at all. I can personally recommend everything in this article as far as things to see/do. Don’t miss those beaches! 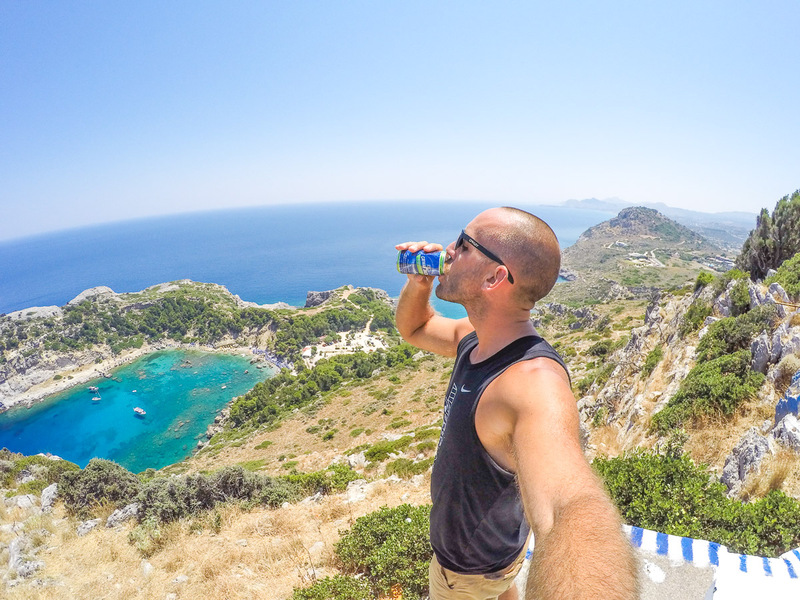 Thank you for writing this post as it has made up our minds to visit Rhodes this summer! Me and my boyfriend are looking for the best of both worlds with regards to beaches and historical site seeing (I’m a loyal sun worshiper whilst he’s a history buff), and I was wondering if there was an area/place to stay you could recommend to accommodate that? Thanks in advance! Hi Ellie. I’m so glad to hear you’re making the trip to Rhodes thanks to my post. If you’re looking for a mix of history and a variety of beaches to choose from I’m not sure there’s a better island for you. 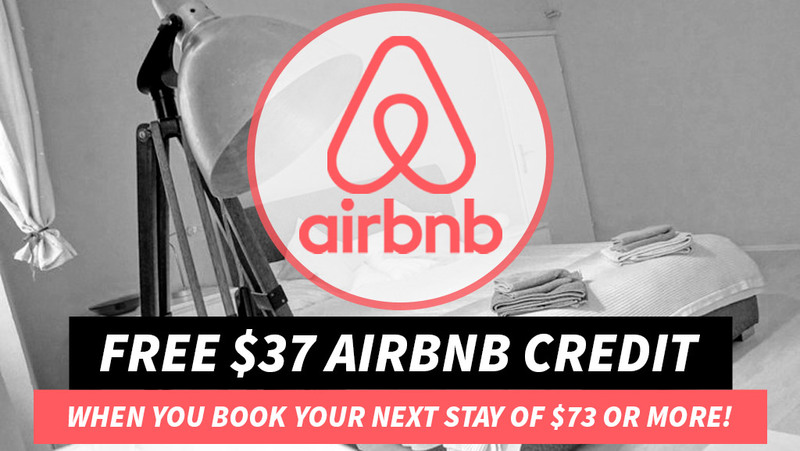 I would recommend staying at the airbnbs I mentioned in the “Where to Stay” section of this post. Wishing you the best of luck! Me and my boyfriend have planned a holiday to Rhodes in September. Really interested in some of the places you have mentioned that aren’t so obvious to get too. Can’t seem to find the map you say you’ve noted them on though.. Am I missing something?! Hi Debbie. Congrats on your upcoming trip! 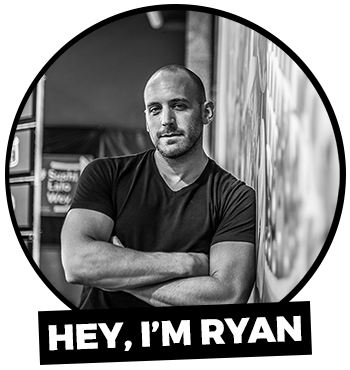 Hi Ryan..thanks for all the great info .We’re looking at visiting Rhodes in September. Just wondering whether you would recommend staying in the old city of Rhodes for the whole week and just making day trips out or staying part of the week in some of the other places you recommended seeing? If so which villages would you recommend ? Hi Julie. Yeah, I totally recommend staying within the Old City and doing day trips from there. The best thing to do is rent a car and just drive the east coast. You’ll stumble upon a bunch of beautiful beaches, villages and more. I would say to go with no set plan other than to road trip the east coast and see where the wind takes you. There’s so much to see/do and you might just decide to kick it at one of the amazing beaches along the way. Best of luck! Beautiful place! I would love to visit Rhodes soon! 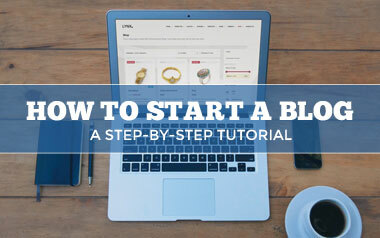 Thank you for sharing this guide! Tnx for info. Go on end of July, so many hellp from you. You’re welcome, Vlada. Glad to help! Best of luck and enjoy your trip to Rhodes! I am from Greece and I will go to Rhodes with my boyfriend mid July. Thanks for the post it was very helpful. Hi Vassiliki. Thanks for the comment! Enjoy your trip to Rhodes. I do not find any map at the end of the post. I am very curious about this little spot, so could you be so kind and tell me where it is exactly? The “bench” I speak about is the picnic bench icon on the map. Hopefully that helps! Best of luck and enjoy your trip to Rhodes! Haha! That’s too funny. You can’t get away from me. Thanks for wonderful post; one can easily plan a holiday without seeking much help from other travel agents. I will definitely plan a holiday to Rhodes in 2020, in case if required I will seek your help, thanks for wonderful post. WAO. The water Looks great for swimming. Overall the place itself very beautiful. Nice tips and trick to Rhodes ! Hey Ryan. 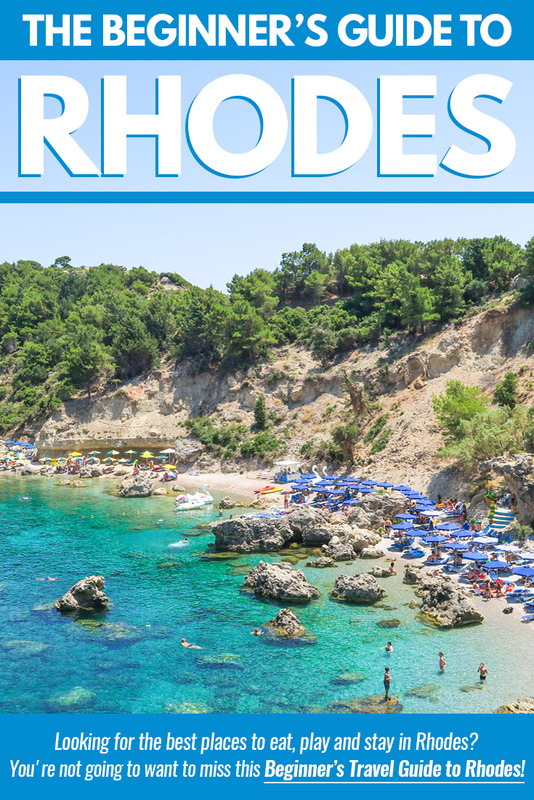 Just found your article on Rhodes as I’m interested in going soon. This peice is great, you laid out all the information I needed and more! Lots of great tips and handy hints. Can’t wait to read more of your blogs. Thanks Steph! Enjoy the trip. Thanks for the great information. My husband and I will be visiting Rhodes for 5 days in July. Looks like we should stay in Old Town and rent a car, per your suggestions. It’s our first visit! No problem at all. Always happy to help! Yeah, it would be best to use Old Town as your base and explore different parts of the island each day. Best of luck!